Free photos is a HUGE bonus, and big factor in choosing a race if there are a few I'm thinking about. I've only paid (the ridiculous amount) once - but there were three of us in the pics so it was 'worth it'. But - I didn't pay for pics from my marathon. LOVED that RWF had tons of great & free photos! I definitely like when I run a race with someone else and can split the cost of photos. It makes buying them a lot more justifiable. I hope more races provide free photos in the future, even if it means the cost of the race is a little more. 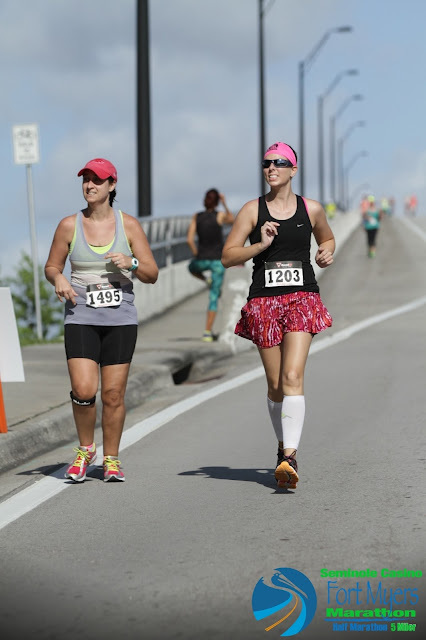 Free race photos are awesome! This is one reason I love mud runs- photos are always free! Marathonfoto is my least favorite company- it is ridiculous how much they charge. I hope BDR provides you with free photos! Otherwise I usually just leave the watermarks on and download them without buying them...I refuse to pay $50 for one photo. I've done the same, but over time I feel guilty about sharing or posting the watermarked photos! You still look great in your race photos even though you were tired! I laughed at your "searching for Wendys" pic because you guys do look like you are looking around for something! 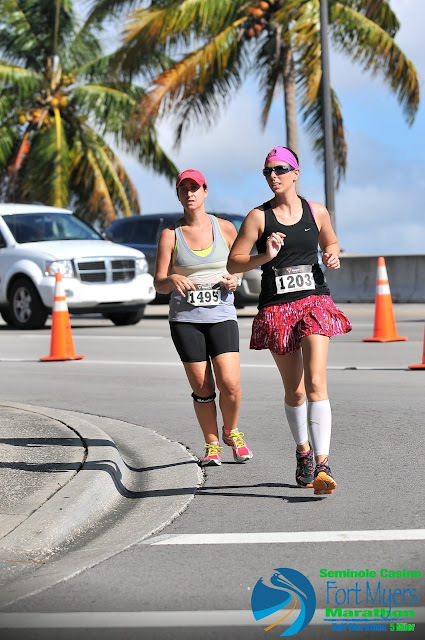 I have never bought race photos because they are so freaking expensive! Luckily, I have had family there to take at least a pic or two in most of my races. When I ran Boston the first time, they offered a DVD of highlights of you running it. I will admit, I bought the DVD!!!! I watched it once and it was cool. I don't know where it is now. I mean, it's in my house, that I know for sure! Aw, thanks! I am very savvy about trying to look like I'm enjoying myself and keeping an okay pace when I see a photographer haha. Today I did quite a bit of pretending for the final cameramen as well. After today I am even more impressed by your finish in this half marathon. It was 80 degrees but cloudy and I still felt hotter than hell. If the sun would have been out I don't know what I would have done. You are a champ! I hope the trend for free race photos continues as well. I absolutely refuse to pay $20 for a digital download of a photo. I suppose the race companies have to charge so much because so few people actually buy the photos and they have to pay for the photographers to be there probably at half day rates ... but I think they could sell so many more if they made the photos a more reasonable price. I would pay $5 per digital download and I would probably buy two or three pics from my more memorable races. Instead they get 0 dollars from me for every race! This weather has just been so tough. I know it's going to be a warm winter all over the States; Florida is definitely feeling the worst of it! If they upped the cost of a race by $5-10 and made photos free, I think they'd make more money overall. As it is, people just pirate the photos now anyway! You look great in your photos!! I love your outfit, too. Can you please tell me how to take a good race picture - because yours look awesome and I always look like DEATH! Runner's World gives away free photos, too. I hope that trend continues. It's such good advertising for the race - why not? I only ever bought one photo and it was recent. When I broke 1:30 in the half and I saw the clock as I was finishing, my face was hilarious. Needed it! Thanks! A spectator told me she liked my tutu, and I was like, "Well that's a first..." because it's just a running skirt. 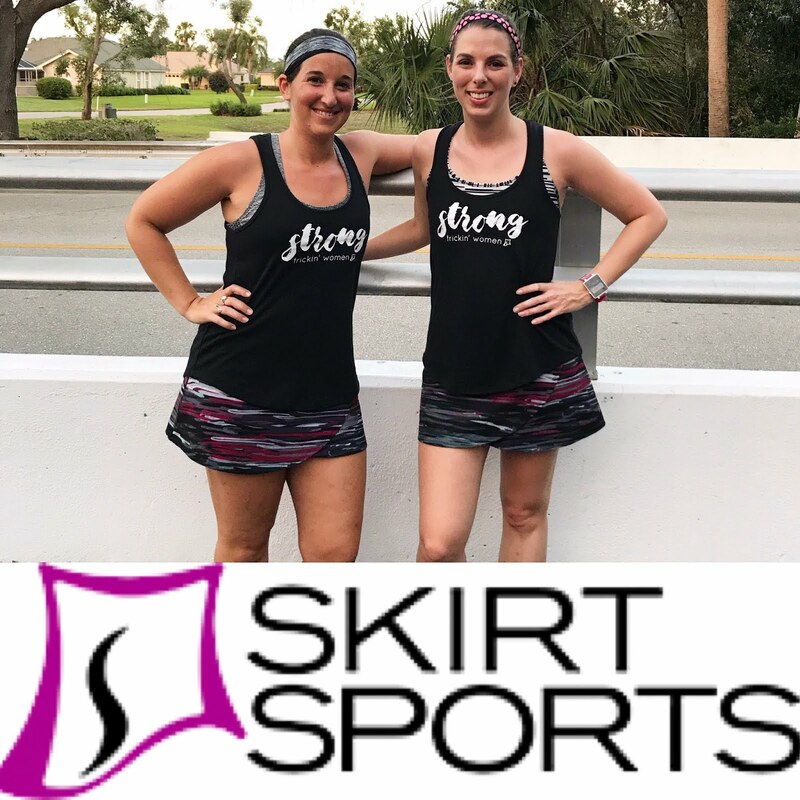 I used to hate running skirts but the pockets can't be beat. When I see a photographer, I stand up straight, shoulders back, and smile. And then I wave or give a thumbs up. It seems to work 50% of the time lol. But I think I look "good" because I'm not pushing the pace nearly as much as I you...I'm not running close to a 1:30 half!! I agree that all races should have free photos. 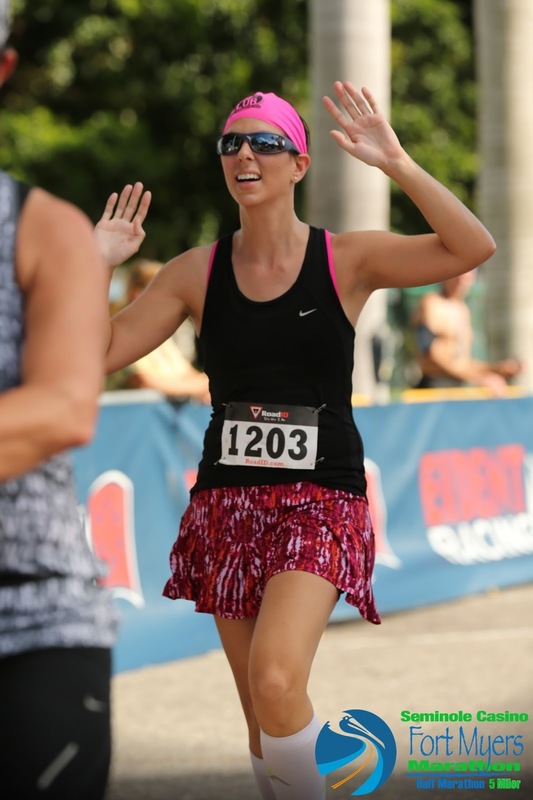 The only race photos I've bought are the ones from last year's Disney Wine & Dine. My mom and I ran together and got some really great photos that needed to be bought. 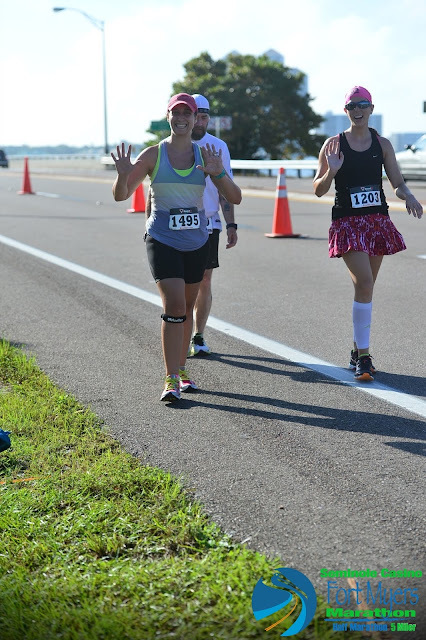 There's one picture from my last half that I really like but marathonfoto charges $30 for one picture which I think is crazy! Marathonfoto is the WORST. Not only do they overcharge like crazy, but they really try to crack down on people who post the watermarked images. I get needing to pay your photographers, but there's no WAY you can justify a $30 single photo!! Your photos are awesome! I always look so terrible, so I never buy my photos. I do like it when races give them out for free, but I never seek out races that have free photos. Maybe if I looked cute in some of my pics, I'd by them. Haha! I think in races where I'm pushing for a PR or a strong finish, I don't look nearly this put together! 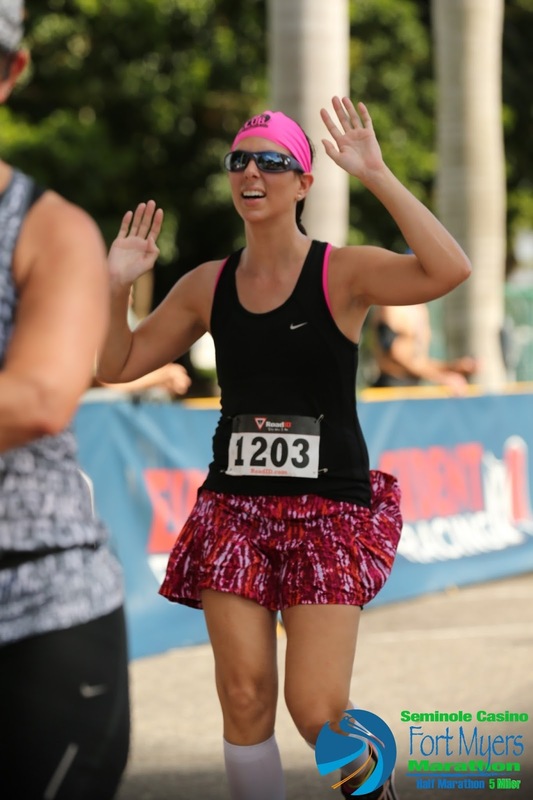 I was melting in this race, but kept such an easy pace that I could pull off looking solid for pictures haha.